If excitement for you is all about the action, brawns and muscles, a game that you need to play should fit right up your alley. 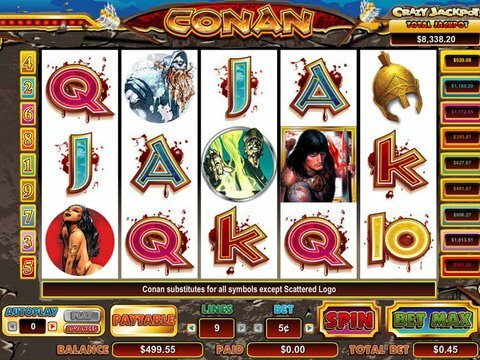 Amaya Software has got you covered for all the invigorating and adrenaline-inducing stuff you need which you can take a daily dose of from the Conan the Barbarian Slot Machine. Its title speaks for itself as it centers on a Barbarian that's about to run rampage on your screen. Not only will it boggle your world with its epic atmosphere and environment - its breathtaking features and rewarding nature would also be the perfect prize for you. Gain merits on this game that will plunge you into war and chaos and you may be looking at a life-changing opportunity. The no download Conan the Barbarian free play slot demo in this page could give you a great view of what I'm talking about and you could go immediately as no registration will be asked from you to revel on it. Raise your shield, prepare your sword and fight for your life as you enter the battlefield in the Conan the Barbarian Slot Machine. You'll surely feel your blood boiling in excitement right from the get go as you enter the world and see the blue sky infested with rocks, arrows and intensity of war. The reels at the center is placed on a rock-like design, pierced by arrows for a more dramatic effect that will get you going for more. The reels itself runs on a simple 5-reel and 9-payline structure, but don't let it fool you as the mysteries it possesses are enough to keep you playing it again and again. The control system cleanly placed at the bottom possesses enough comprehensiveness to help you manage your stakes at the game. The betting can go up to $45 per spin and with this max setting, you could just welcome a jackpot that's more than you could imagine. This game is part of the Crazy Jackpot Series from Amaya Software, and with that fact, it comes with no surprise that the game possesses a whopping 9 Jackpots for you to win. The grand total of jackpot can reach up to almost a million bucks and this kind of glory up for grabs, is definitely enough to plunge anyone to insanity and excitement. The Conan the Barbarian plunges players to chaos and violence of the olden times which is pretty evident with arrows and all. If you want something more innovative in the same category, then the Platoon Wild Slot from iSoftbet may just be your thing. The game comes with compelling environment while characters are portrayed in realistic images. It also utilizes grand features to motivate you to acquire merits while a whopping 50,000-coin jackpot awaits you at the end of the war. In War, battle of luck and attrition sits behind the chaotic battle of power but this doesn't mean that its not important. This is also the same as gambling and by playing at Cresus Casino, you could guarantee that you'll have increased winning chances in playing the game. You'll be presented with fresh promotions from 100% match-up and 20 free spins bonus as soon as you enter while loyalty and VIP programs await you in the long run.